Three different ongoing storylines centering around Donald Trump and Russia have all converged into the same story today, thanks to the arrival of a piece of information which connects the dots between all three. The short of it: we know now that Donald Trump fired U.S. Attorney Preet Bharara while he was prosecuting the Russian spy who had first recruited Trump’s campaign adviser Carter Page into the Kremlin fold. Here’s the storyline as it now fits together. According to new reporting today from BuzzFeed, Russian spy Victor Podobnyy has been caught bragging that back in 2013 he first recruited Carter Page and convinced him to begin handing over important documents, in exchange for the empty promise of making Page rich. Then in January of 2015, U.S. Attorney Preet Bharara went on to bust Victor Podobnyy’s Russian spy ring in New York (source: Los Angeles Times). 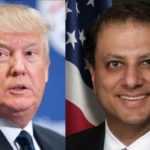 Bharara had been continuing to pursue the prosecution of Podobnyy, until Donald Trump suddenly and unexpectedly fired him last month. Now today, evidence has leaked out revealing that Podobnyy first recruited Page.